The Ramp-age is on! For the next few weeks, you can find these springtime gems at local farmer's markets and produce sections. Get them quickly as they disappear by early June. Ramps are also known as wild leeks. They have the appearance similar to a scallion with a bulb that has tinges of purple and red. Although they may look like a scallion or leek, ramps are know for their delicate flavor that seem to be a cross between an onion and garlic. And the entire plant is edible, even the root! Ramps are high in vitamins A and C, both benefiting us as our bodies awaken from the winter blues. Both these vitamins strengthen our immune system and support our skin, teeth and bones. Vitamins A and C are antioxidants that help our bodies neutralize harmful free radicals that are associated with many diseases. Ramps contain the mineral, selenium, that is needed for the proper functioning of our thyroids, the master gland regulating our metabolism. In addition, ramps contain chromium, a mineral that is essential in regulating our blood sugar and metabolizing fats and carbs. Ramps are known to grow rampant in the Appalachia's although care should be taken to not remove the entire plant as they take a long time to re-grow. And back in the 17th century, the city of Chicago is believed to be named for ramps. The native tribes named the plant "Shikaakwa" as these plants were found growing densely around Lake Michigan. 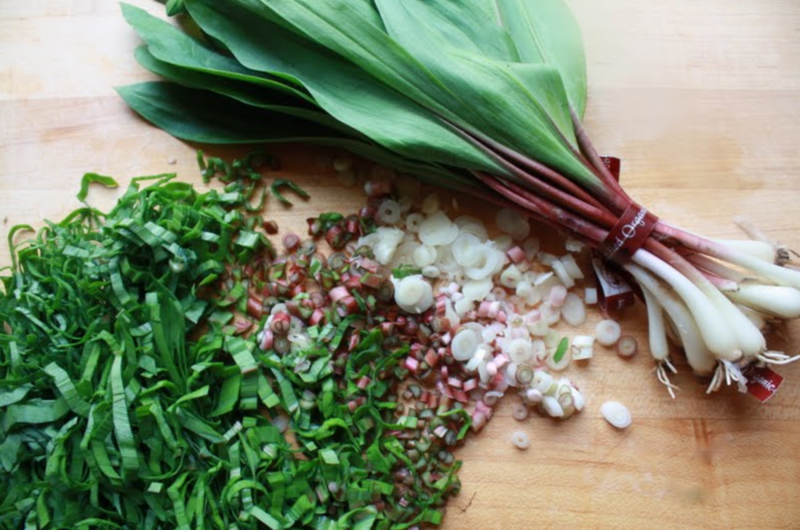 Ramps can be prepared with foods that pair well with garlic. They can be used in a similar fashion to scallions and leeks and will bring a wonderful flavor to risotto, eggs and soups. I even heard of pesto being made from ramps! Enjoy these spring wonders and all they bring to our bodies!